" This is how we see the world. We see it outside ourselves, and at the same time we only have a representation of it in ourselves. In the same way, we sometimes situate in the past that which is happening in the present. Time and space thus loose the vulgar meaning that only daily experience takes into account." " For the spectator, it was both inside the room within the painting and outside in the real landscape. This simultaneous existence in two different spaces is like living simultaneously in the past and in the present, as in cases of deja vu." -- Submitted by Gretchen. "Questions such as 'What does this picture mean, what does it represent?' are possible only if one is incapable of seeing a picture in all its truth, only if one automaically understands that a very precise image does not show precisely what it is. It's like believing that the implied meaning (if there is one?) is worth more than the overt meaning. There is no implied meaning in my paintings, despite the confusion that attributes symbolic meaning to my painting. How can anyone enjoy interpreting symbols? They are 'substitutes' that are only useful to a mind that is incapable of knowing the things themselves. A devotee of interpretation cannot see a bird; he only sees it as a symbol. Although this manner of knowing the 'world' may be useful in treating mental illness, it would be silly to confuse it with a mind that can be applied to any kind of thinking at all." What represents the picture are our ideas and feelings--in short, whoever is looking at the picture is representing what he sees. This idea is not, some say, within the realm of knowledge, so it won't help me protect myself when the occasion arises." 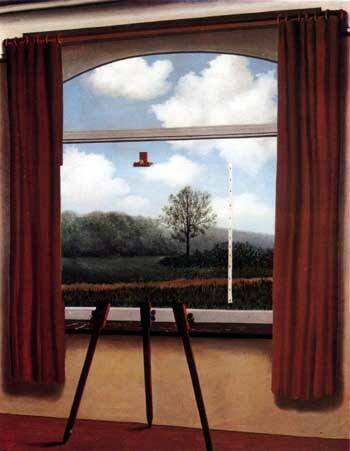 Although I feel that Magritte painted many works that could be included here, this one probably relates to the Core Wave more than the others. I am interested in Magritte's work because he not only proposes important questions in his paintings, he does so with a great sense of humor. When I first looked at the painting, I saw a window with a pastoral scene in the background, then I noticed the easel. My mind did a flip-flop and I had to refocus my attention to the subject. I felt outside of the painting, yet inside the work itself. My viewing and interpreting of this piece became part of it.